They're not just showcasing locally sourced produce from other East Gippsland businesses at Sailors Grave – they've got the family farm to plunder too. 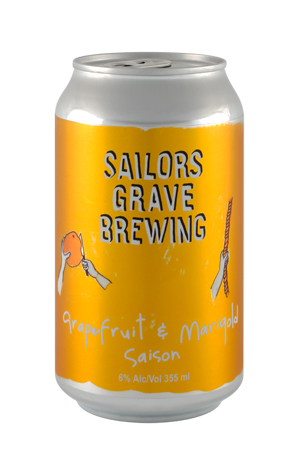 That's where they gathered the grapefruits and marigolds that have been added to this saison. The result, perhaps unsurprisingly, is one of the fruitier local takes on the style. Juicy grapefruit mixes with sweet, honey malts, subtle spicy esters, citrus and a touch of banana in the aroma, while this hazy yellow drop comes with a smooth and pretty full body in which you'll zesty grapefruit, soft spices and a steadily building, dry and herbaceous finish.